Thank you for your interest in the Lord’s work at the Anthony church of Christ in Ocala, Florida. We offer worship services, Bible studies and spiritual guidance for anyone in the Ocala area who is interested in seeking out and serving the Lord. We are not a building, but a group of Christians gathered together to worship God and encourage one another. Our goal is to be pleasing to God in all that we do. We use the Bible as our “soul” source for how God wants us to live our lives and how to treat others. We are simply Christians, with a goal of living our lives and worshiping God in the way He prescribed for mankind. We at the Anthony church of Christ in Ocala, Florida invite you to join us in worship and in Bible study. 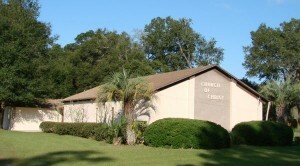 The Anthony church of Christ is just north of Ocala, FL in North Central Florida.